﻿ Real Madrid 3-0 Elche. Homework done at the Bernabéu! 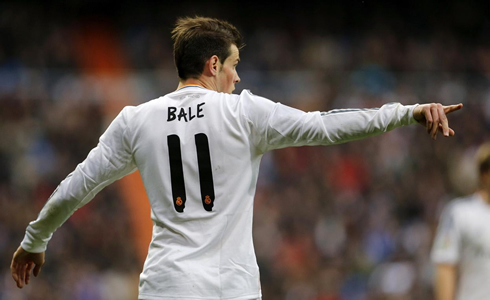 22.02.2014 » Real Madrid 3-0 Elche. Homework done at the Bernabéu! It was a calm Saturday evening at the Bernabéu, as Real Madrid easily got past Elche by 3-0 and with that, they made sure to transfer the pressure to their rivals Atletico and Barcelona. Cristiano Ronaldo served his last game of suspension and therefore, the hosts' goals had to come from his teammates. 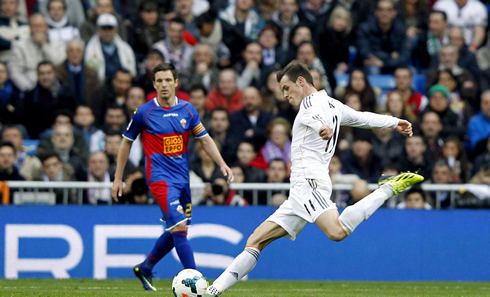 Illarramendi, Gareth Bale and Isco stepped up to secure the victory. Real Madrid has completed their 3rd straight league win without having Cristiano Ronaldo available to help, after beating Elche in the Santiago Bernabéu, by a clear 3-0 score. The Spanish Sports Court announced their decision of keeping the 3-game ban to Ronaldo just a couple hours before the gamed kicked off, which forced Real Madrid to go into another game deprived of their biggest star. Fortunately for the Merengues, Elche didn't prove to be much of a challenge and thanks to goals from Illarramendi, Gareth Bale and Isco, Real Madrid managed to pick the 3 points and take La Liga's lead temporarily. Atletico Madrid steps on only this Sunday and Barcelona will visit Real Sociedad later this Saturday. 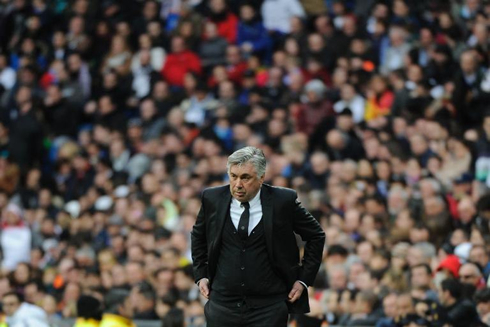 Even though the Merengues have a crucial game scheduled for next Wednesday against Schalke 04, Carlo Ancelotti didn't give any rest to most of his key players, especially after knowing that he wouldn't be able to count with Luka Modric and Cristiano Ronaldo (both suspended). One of the few exceptions was Sergio Ramos, who saw Varane stepping in to take his usual place as centre back, while Illarramendi filled in for Modric in midfield. Upfront, Jesé, Gareth Bale and Benzema had the mission to make Ronaldo's absence go unnoticed. The opener arrived deep in the first half and from a highly unlikely goalscorer. With 34 minutes on the clock, Di María took a corner kick on Real Madrid's left attacking side, but saw his cross being cleared away by Pepe, his own teammate. 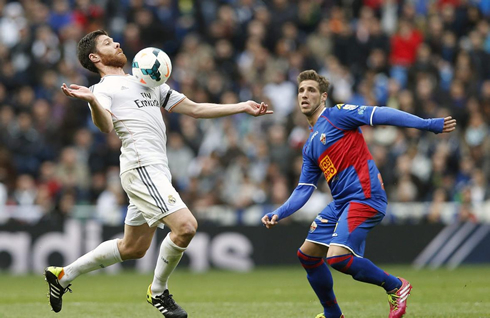 Fortunately, the ball ended up rebounding near Illarramendi and it only took one touch for the former Real Sociedad's midfielder to control the bouncing ball and fire away a powerful shot. With so many bodies in front of him, it wasn't that surprising to see the strike getting deflected and tricking Sociedad's goalkeeper. Real Madrid was in front for the first time in the evening and Asier Illarramendi had just scored his first league goal for his new club. The visitors felt that second goal as if they had been punched in the stomach and as Real Madrid brought new and fresh players into the game, it would only be a matter of time until someone extended the lead. That ended up happening in the 81st minute, after a good combination between Karim Benzema and Isco. The Spaniard, who has been spending most of his playing time on the bench this season, made sure he seized his opportunity this Saturday and with his left-foot, he finished off an assist from the France international. This goal allowed him not only to reach his 7th in the league this season, as he also closed the count for the day at the Bernabéu. With this victory, Real Madrid goes top of the league with a temporarily 3-point gap between them and their two main rivals, Atletico and Barça. Cristiano Ronaldo has now finished serving his 3-game ban in La Liga, which means he will already be eligible to play next weekend, in a crucial match against Atletico Madrid, at the Vicente Calderón. Before that though, Real Madrid and Ronaldo will clash against Schalke 04 for the UEFA Champions League first leg, right this Wednesday. Attackers: Gareth Bale, Jesé Rodríguez, Benzema. Cristiano Ronaldo next game for Real Madrid will be in Germany against Schalke 04, for the UEFA Champions League last-16 round first leg, on February 26 of 2014. You can watch Juventus live stream, Schalke 04 vs Real Madrid, Osasuna vs Atletico Madrid, Liverpool vs Swansea City and Norwich vs Tottenham live, all matches provided from our football streaming section.